It has been a very tough week here at Chez Angel. If you had told me last Friday that I would soon witness my little guy have two febrile seizures in less than 30 hours, I never would have believed you. Most of the week has gone by in slow motion as we have battled a high fever in hopes of avoiding yet another seizure. 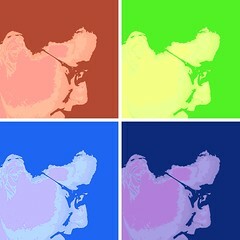 Over the week, TechyDad and I have had a lot of time to think about things. TechyDad sat down and actually wrote about the scariest moments (thus far) in his life. Many people may not understand how we are able to sit and type these out, but it truly is therapeutic. I know that last February, and again this week it helped me to get my fears out in the open, to face the facts. Did I cry? Did I have nightmares of seeing my blue and lifeless son in my arms? Of course I did, but blogging helped immensely. What is the scariest moment of your life so far? If you are a parent, does it have something to do with your children? My answer this week would have to be the same as what TechyDad wrote. Probably most of my pregnancy with my daughter. I lost my first baby halfway through the pregnancy, so being pregnant again was super scary and stressful the entire way through. When I was pregnant I had a few scares. Two were very early on. The second was scary because I had already seen Baby Sister’s heartbeat. I had to go to the ER because my doctor’s office was terrible. But that was not the worst moment. A few days before I was due all of a sudden in the middle of the afternoon I could not feel Baby Sister move. They had told me I should feel her move ten times in an hour and I hadn’t felt her move at all in a little over an hour. We immediately went to my midwife’s office (we left the doctor after the ER incident). It was so scary. I was really worried that we were losing her. Our son had to be sent to the NICU at a children’s hospital over an hour away from where I was recovering from my c-section. The scariest was seeing him breathing very weirdly and not knowing what was going on and feeling very helpless and unable to control the situation. I feel for you guys and know how frustrating it is not to have answers. I hope you find out something soon. I had to make my own Blog Post to answer this one. Way too much to just leave a comment. Head on over and check it out. Although you might remember it. The scariest moment of my life was just a couple of weeks ago. I was going in for surgery with a lot of unknowns… it was the first moment I felt that I could actually die. I worried so much for my children… It was so scary. It would have to be the time I found Girlie Girl at the bottom of a 9 foot swimming pool. I jumped in to save her even though I can’t swim myself. I think mine would be when one of my ultrasounds showed a problem with the heart valves on one of my twins. Luckily it corrected itself, but the waiting to see and wondering was awful. Everything I’ve experienced in my life all seems minute when I think about even the tiniest things with my son. During labor they had to put a monitor into his head while he was still inside of me because his stats were dropping and he had a crazy high fever. Then, right around his 1-year birthday he came down with a crazy bad flu that left him dehydrated, and worst of all, we were on vacation and couldn’t see his pediatrician. I took him to the ER and I just remember thinking all the worst things ever. But, wouldn’t you know this little stinker acted fine as soon as we saw the doctor? And, even held down a FULLL can of 7up while we were at the hospital. Tryin’ to prove me a fool … oh, and YES, he totally threw up the 7up on the way home from the hospital. I’m sure that ER doctor just thought I was a paranoid kook. Hubby and I were w/ my family in Hawaii during the Christmas holiday. We got a phone call from our youngest DD in Florida that she and the kids were in an accident! The SUV she was driving while towing a RV Trailer flipped and started rolling down the freeway. DD wasn’t wearing a seatbeat and was ejected from the car…lucky that it didn’t roll on top of her! The grandkids (1 month and 2 yrs at the time) were in car seats and nothing happened to them! My scariest moment was back in 1996, I was in a car accident. Not to bad, we just got some black and blues, but this was my first car accident that I ever was in. We hit a tree. My friend was driving and there were 5 of us in the car. The driver was playing around with the radio, and it was dark on a dirt road and he just lost it. I was so scared, because no one knew where we were, I got out of the car and went in to shock, which I never had experience before. I remember looking at the moon, and everything was caving in and I thought I was going blind, next thing I know, I’m waking up in the middle of the road with my best friend and cousin over me crying, because they had no idea what happen to me. That was scary. When my daughter flipped out of her bed and knocked her tooth out – lots of blood, screaming, couldn’t really see what happened because of the blood. Sarah’s last blog post..Aloha Friday – Easter Traditions? One of the scariest moments involved our youngest. He was only 6 months old and very ill. His pediatrician suspected he had meningitis and we rushed him to the ER. They had to do a spinal on him and it was so awful. Thankfully he didn’t have it. 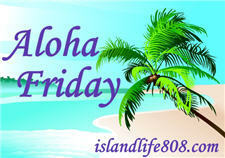 Elle’s last blog post..Aloha Friday ~ No Offense! When my eldest son who is a grown adult was 5 he got his foot caught in an escalator. I was scared and it was hard to get his foot out but he was okay. cancer scare with my son when he was 10 months old. There have been many scary moments,minutes,hours and days in my household. Alas we are like the show Malcom in the Middle. One of the worst times was when my son came in the room crying that his brother had slammed his fingers in the door. I proceeded to wash his hands only to find the tip of his finger–GONE! We were blessed that the doctor was able to reattach it and it healed. ( the doc didn’t think the odds were so good at the time) I will keep you and your family in my prayers. I was induced w/ my son & after 36 hrs of hard labor on pitocen, he was finally born by emergency c-section. It was the middle of the night & after the length of my labor I was exhausted. I didn’t get to see him until the next morning when we went up to the NICU. He had aspirated (sucked it into his lungs) his meconium & was pretty sick. After lunch we got to go back up & he was on a respirator. 7 days later he was life -flighted to a local German hospital where his life was saved. All in all it was one month that he was in the NICU. Those first 2 weeks were some of the most frightening moments of my life. Ever. 2 weeks ago when I found out they left my 4 yr old son on the school bus and forgot him for over an hour. It was snowing out that day and he was found when one of the students heard him screaming on the bus. First I would like to tell you I will be lifting you up in my prayers. Having sick kids is tough enough but is sounds like you have had a really bad week. My prayers are with you. In general I have been very lucky. However I do stress week after week as I send my kids to my mother-in-laws for her time with them. She is old school and she lets them run wild and doesn’t do things the way I expect. When my oldest was 1 she drove him in the front seat of her car (air bag seat) with just a seat belt. I could have killed her for that one. Then she drove my son around in a car seat that wasn’t strapped in, then last year my little guy was a couple months old and she couldn’t buckle his car seat so she went with him just sitting in the seat. (See why I stress) I never know what stupid stunt she will pull next. Believe me she hears all about it but she doesn’t seem to learn. Our newest one is letting the little 1 year olds outside to play with out any supervision. I just don’t agree with this at all, especially when their is no fence in the yard and they could go anywhere. 9-11! By far, hands down. We were on vacation when it happened and didn’t know if we’d make it home. Swing by The IE Mommy to answer my question. This one is easy. Our toddler had malrotation surgery when he was 2 months old. He spent one of those months being misdiagnosed. We could have lost him. I had to give my wittle baby over to a bunch of surgeons and hope for the best. Thank goodness everything is great! He has a scar but who cares. He’s so much happier. Pamela Kramer’s last blog post..Whoo Hoo – It’s a Party! When my oldest son was 18 months old, he had gotten some sort of flu bug that he just couldn’t kick. I had taken him in to the doctor who said, “stop the milk, just give him clear liquids”. Well, J drank water..alot of it..which dehydrated him. Day 2 after seeing the doctor, I woke up and J was limp. I took him to the ER and waited and waited. I tried to play with him and he just looked at me with these very tired eyes that tried to smile. Finally, they called our name. The tech said, “Are you J?” I told him my son was J. He said, “It says here J’s 18 years old.” I said, “Nope, he’s 18 months”. He showed us to our room where we waited some more. Almost 10 minutes later, J had a seizure. I ran him out to the nurse’s station. They no longer had us wait. My heart goes out to you and your husband. Reliving that time still makes me weak, J is 8 years old now and doing great. I will keep you all in my prayers. Oh boy. That would be pretty scary to go through. I haven’t had anything terrible in recent memory. I remember as a child being scared when my mom had back surgery as I was very young and didn’t quite understand what was going on. I have no balance and fall often especially in the winter when there ice everywhere. This whole winter has been scary for me first being heavily pregnant and then carrying my tiny baby around. Lucky I didn’t fall this year, its a miracle. Well, I know this is lame because the birth of my children probably should be my scariest moment. But for whatever reason even though horrible things could have happened (and nearly did) I was totally at peace during the event. I thank God for that. Really, the scariest moment of my life was when I was in high school. During a rehearsal for a play some pyrotechnics stuff exploded and one of my classmates lost his hand. It really was like a horror film in real life. The boom. The smoke. The ringing in my ears. The screams of my friend and seeing the blood and where his hand should have been. It was awful. The scariet moment so far has been when I thought my son was going to be born at 27 weeks. Luckily the docs were able to stop the labor and he held on til he was 35 weeks. Shari @ A Psych Mommy’s last blog post..Winners! For me, my scariest moment was knowing that I was having a stroke but not being able to figure out how to use the phone (the numbers were all jumbled up–it was like it was in a foreign language) and then when I finally got my husband on the phone I could barely talk and couldn’t get the right word out. That was pretty frightening. (And then it just got worse–the ER sent us home–YUP–they said that I just had a bad headache–so I didn’t get the correct treatment I needed for DAYS!! Even though I went to the ER within an hour of having the stroke–that is what is the most FRUSTRATING!! But, they just didn’t figure that someone “my age” would have a stroke–plus my cat scan was “normal”…ARGH!! My scariest moment would be a phone call from a hospital saying my mother was in an accident. When I saw your response to my question of what is your theme song, I knew you had to be a mom of a young one. God bless you all. Nothing worse really then something involving your child’s physical life. My first scariest thing was when my then six week old had projectile vomiting episodes which led me to the doctor who told me he had good news and bad news. The good news was, he knows what is wrong, the bad news was, my baby had to have surgery today for pyloric stenosis. My second scariest thing was when the telephone rang and it was the police telling me my husband had been in an accident on I435. It was rush hour and he was riding a motorcycle. The drive over there, by myself and the walk down the hallway to ER were terrifying. God is good and my DH is smart. He wears a terrific helmet and very protective clothing. I guess I should say wore because, well, they served their purpose but it is a one time kind of thing. God also provided angels in the form of drivers who formed a protective shield around him with their cars until the ambulance could get there. Becoming a parent. Realizing I was responsible for a tiny little life was very humbling and terrifying yet wonderful. I’m sorry about what you went through. I hope your son is better now. When my son was 2 years old, he slipped and hit his face on the ground. When I picked him up there was blood on his mouth. I rushed him to the emergency room and I’m glad that it was just a minor cut and didn’t require any stitches. It healed perfectly well within a week.